So after yesterday’s discovery of an undocumented Spinnaker game hiding in a pile of 90s GIFs (you did read that, didn’t you?) I was inspired to dig a little further into the GIFs Galore CD. And what I found, and brought back to life, was a lost Power Glove dinosaur. Let’s back up for a second. I’d like to introduce you to someone who, if you’re a fan of pixel art, shouldn’t need an introduction. This is Jim Sachs. 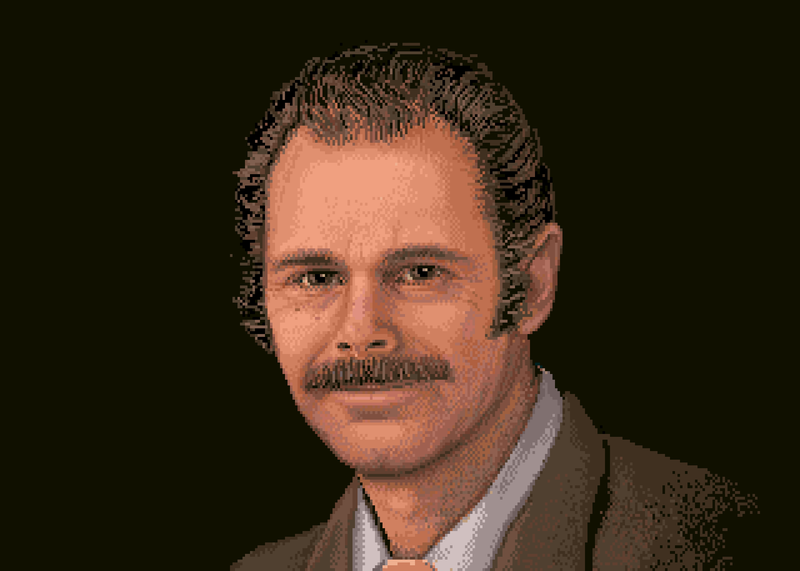 Or more specifically, this is a self-portrait of Jim Sachs, drawn on a Commodore Amiga. Jim Sachs is, hands down, one of the greatest pixel artists of all time. In terms of games, he’s probably best known for his work on the original Defender of the Crown on the Amiga. 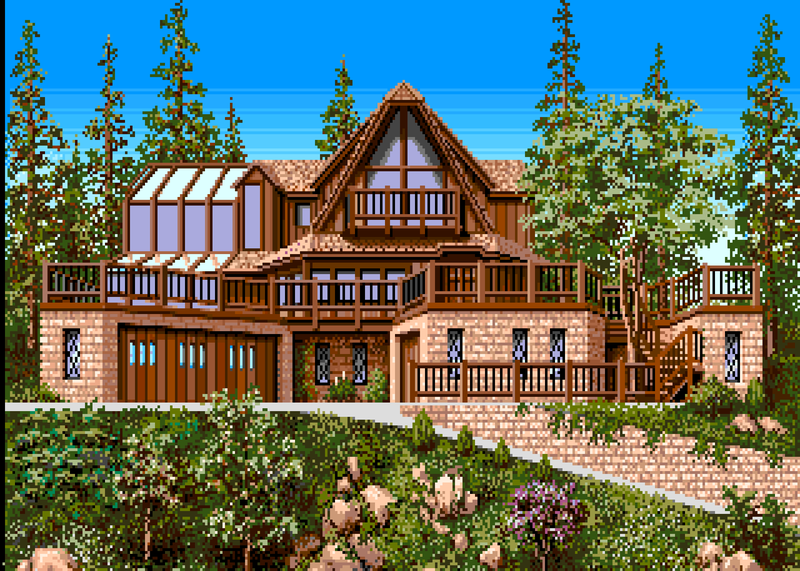 If you haven’t, do yourself a favor and spend some time looking at the Jim Sachs gallery on the Amiga Graphics Archive. 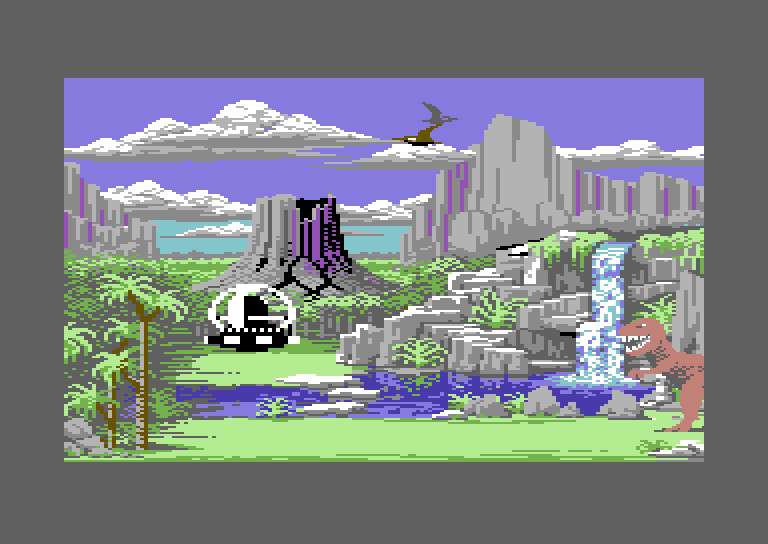 Development on the game was dropped, according to Sachs, due to the C64’s rampant piracy. 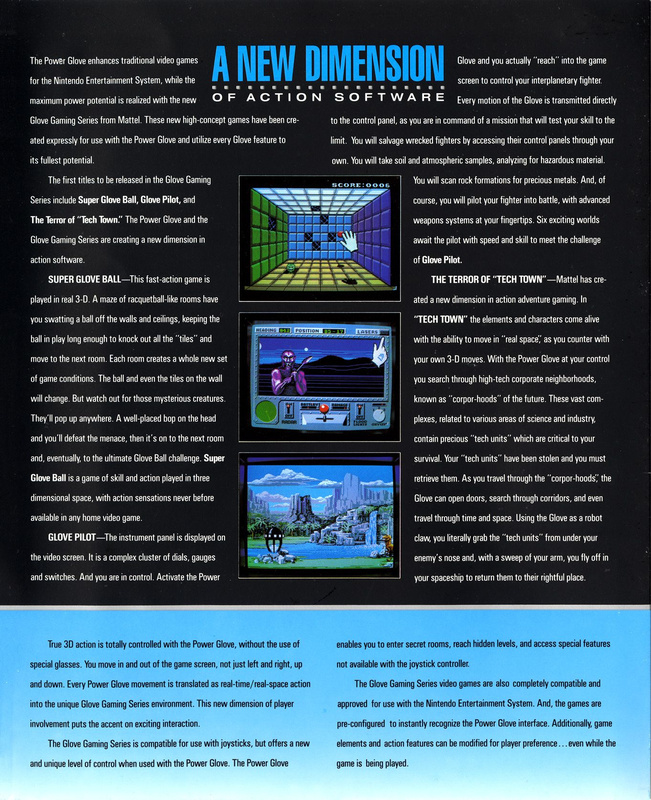 Sachs moved the project over to the Amiga, but that version of it has never been seen…at least, not in a way where it was identified as an Amiga game! This all brings us back to yesterday when, while digging through the GIFs Galore CD, I came upon some Jim Sachs art. This isn’t surprising: the GIFs Galore CD is full of hundreds of random GIFs pulled from BBS boards at the time, and Sachs was known for sharing his artwork liberally, passing around disks to drum up interest. 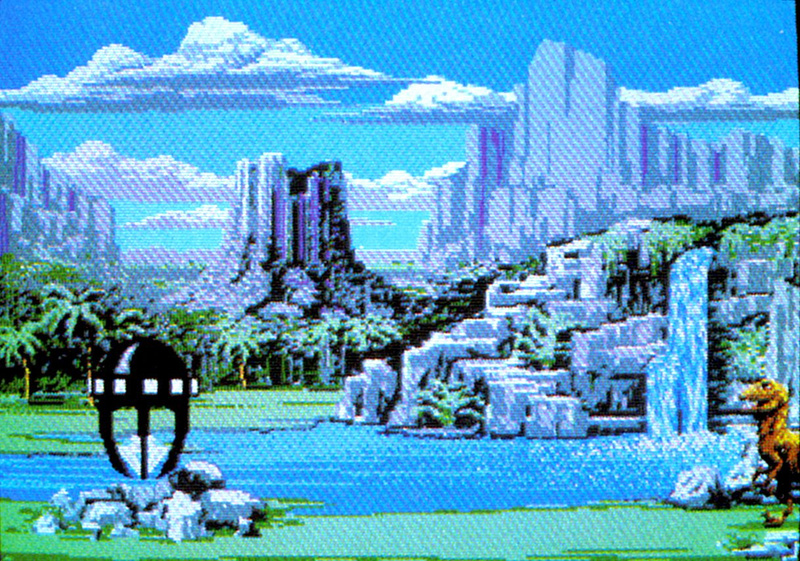 Here’s a piece that I recognized right away: an image Sachs drew on the Amiga of his dream house. 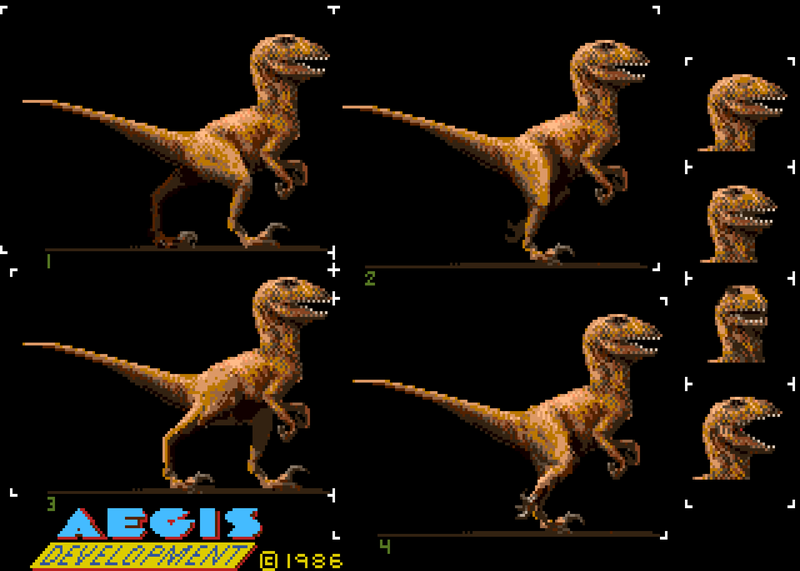 If you look closely there are some minor differences (the head’s a little rounder in the screenshot I scanned, and in the video, you can see that its tail is arced down instead of pointing up) but that’s clearly the Time Crystal Amiga dinosaur. And in case further proof is needed, Aegis Development was the publisher of Ports of Call, a game for which Sachs contributed artwork. I brought our friend back to life by timing his movements to correspond with the C64 version. It’s not perfect, but it’ll do. And that’s how I excavated a dinosaur and brought a lost piece of Power Glove history back to life.